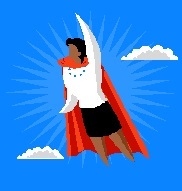 I’ve talked to several companies whose principal strategy for future business success seems to be “Hire a superhero!” They know they do well when they hire a superhero sales guy, a superhero manager, a superhero designer. And yes, extremely talented individuals can make a difference at critical points in the development of your business, especially in the early days or when major change is required. The trouble is, there aren’t enough to go around. If you are only successful when you have one of these rare talents on your team, then what do you do if you can’t find one, or your superhero is enticed away, or killed by kryptonite? By relying on superheroes, you’re limited in how far you can take your business. Don’t misunderstand me - I believe in hiring the best; but to be a viable business model, yours needs to work with the people you employ everyday. You need a compelling market offer and business processes that can be delivered by ordinary mortals - talented, motivated, enthusiastic, ordinary mortals.